Putting a venerable institution into another’s historic location is a design challenge that requires both creativity and the ability to meet municipal by-laws protecting the look of an old neighbourhood. Penny tile in the coffee shop consisted of irregular 1 x 1 in. Bianco Carrara marble and Trencon black marble tiles, painstakingly installed by master tiler Sylvester Bardzki of Fenix Flooring. Photo: Robert Lemermeyer, Lemermeyer Photography Inc. Click/tap on cover to see complete issue of Sept/Oct 2017. 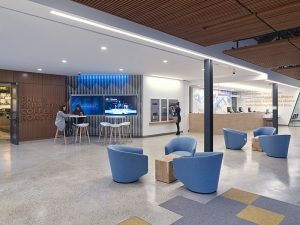 ATB Financial, founded in 1938 as Alberta Treasury Branches, tasked the architecture firm Lemay + Toker with relocating its 9th Avenue branch in Calgary, Alta., and corporate space to the main floor of the city’s historic Hudson Block Building at 102 8th Avenue SW. Formerly the Hudson Bay Company Department Store built in 1891, the Roman revival-style heritage building has been redeveloped as a cultural hub at the heart of downtown. 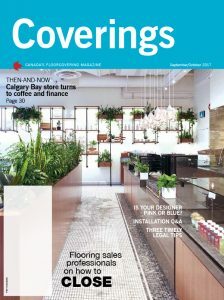 Lemay + Toker’s Calgary office partnered on the project not only with ATB Financial, the largest Alberta-based financial institution, it also worked with Calgary-based Phil & Sebastian Coffee Roasters, to develop an inviting, community-oriented space showcasing local artists and the latest in retail design. 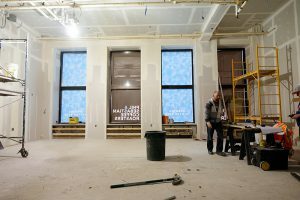 “The project was hard to get off the ground initially,” according to Lemay + Toker architect Grace Coulter, who was assigned to the Hudson Block renovation along with intern Melissa Cowan. 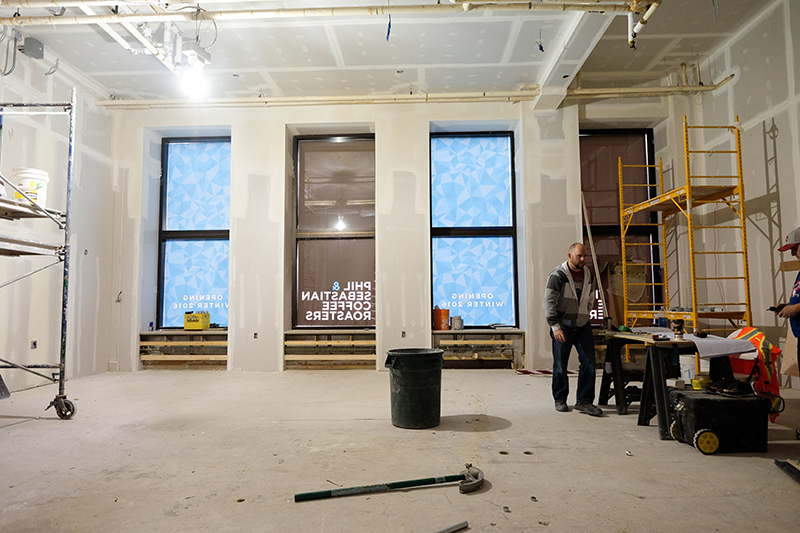 Coffee shop area under construction. Coulter also had to deal with a very old building envelope where there had been many renovations over the years. “There was none of the standing charm left,” says Coulter. “The condition of the flooring, the partitions and the lighting, all the finishes were at their end of life cycle. “So before you walk into the coffee shop we put in a new concrete overlay and polished that up,” says Coulter. ATB Financial space (right), withPhil & Sebastian Coffee Roasters coffee shop on the left. Photo: Robert Lemermeyer, Lemermeyer Photography Inc. The bank’s public-facing areas are defined by custom glass display cabinets, with specialized lighting, for a rotating gallery of quarterly contributions from the local Alberta College of Art and Design. For the Phil & Sebastian Coffee Roasters coffee shop, Coulter says they “We were going for a divergent look and feel as opposed to what was happening in the bank.” Owners Phil Robertson and Sebastian Sztabzyb were very engaged in the design process, she adds. Hudson Bay block exterior. Photo: Andy Nichols. The coffee shop also serves as a gallery space for local Market Collective artists, offering a direct touch point between artists and consumers, with all sales proceeds going directly to the artists. 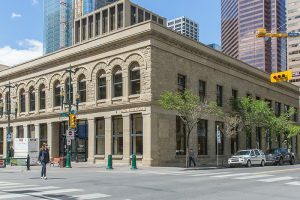 Coulter notes that the clients — ATB Financial and Phil & Sebastian Coffee Roasters — are delighted with the results of the project, especially because it brings together so much of Calgary’s historic heritage and new arts scene under one roof. 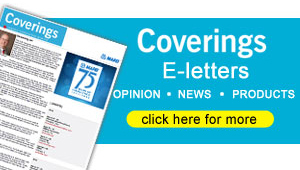 “A very positive experience for everyone,” she says.